The first OLED devices were constructed with a metallic cathode, so the light generated in the device exited through the glass substrate (i.e. the anode side of the device). With the invention and development of a transparent cathode, the light can exit through both sides of the device. In addition, when the device is turned off, the device can be transparent. Transparent OLED (TOLED) technology enables three key features that have the potential to create a host of new product opportunities. 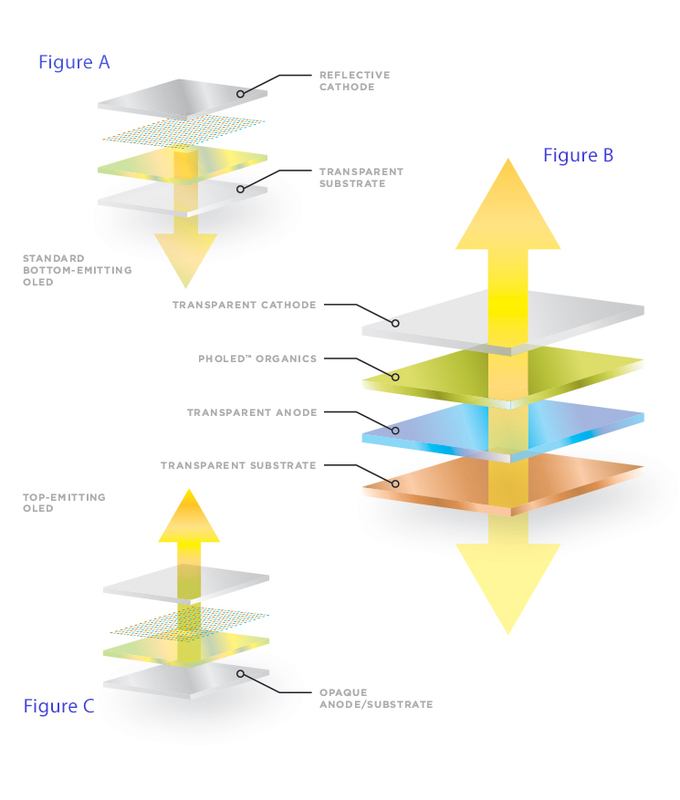 Universal Display’s TOLED® technology is based on a proprietary top contact, or cathode, that is optically transparent. In Figure A below, you see typical OLED, where the bottom contact, or anode, consists of a transparent metal oxide film and the top contact consists of a reflective metal. As a result, when light is generated by the OLED, it emits through the bottom transparent surface. TOLEDs, as shown in Figure B, use an optically transparent top cathode, meaning both top and bottom contacts allow light transmission. With the same proprietary cathode that is used for transparent OLEDs, TOLED technology can be employed for use in top-emitting OLEDs. In a top emission OLED, as shown in Figure C, the anode and cathode work together to form an optical cavity, emitting light away from the substrate and the backplane, increasing the aperture ratio of the display. This is very good for mobile devices and screens where you can turn the display to ensure the best viewing angle, as it increases the light output and increases display efficiency at normal viewing angles. For applications as diverse as architectural windows for home entertainment, retail advertising and illumination, to navigation/warning displays on windshields and heads-up helmet faceshields, TOLED technology can pave the way. Transparency: Capable of 70% to 85% transparency when turned off, TOLED pixels are nearly as clear as the glass or plastic substrate on which they are built. When used in an active-matrix OLED configuration, the effective transmission of a TOLED display may, however, be somewhat reduced depending on the resolution of the display and TFT design. Bi-directional emission: Typically, the light generated by the TOLED emits from both surfaces. Enhancement films and other optical treatments may be used to direct more of the light in one direction than the other. Performance: TOLEDs also offer excellent opto-electronic performance properties, i.e., spectral color emission, luminous efficiency and lifetime – that compare well to those for bottom-emission OLEDs. Stacking: Fabricating one OLED on top of another OLED can be advantageous in terms of improving overall lifetime and also providing a broader range of output color spectrum.